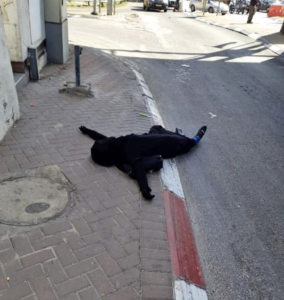 This is the body of Samah Zuhair Mubarak, a 16-year-old Palestinian girl extrajudicially executed & left bleeding to death today at a checkpoint in the occupied West Bank. Israeli occupying soldiers shot her to death & justified it by saying she tried to stab a soldier with the green knife shown here just above her left knee. Remember what French Zionist Bernard-Henri Lévy called the “Stabbing Intifada” & other Zionists & apologists for Israeli crimes called the “Knife Intifada” or the “Lone Wolves Intifada” in 2015? That’s the so-called ‘Intifada’ when the Israeli army gunned down Palestinian young people on an almost daily basis & planted knives on them justify it. There was even film footage of Israeli soldiers planting a knife on one victim. It isn’t possible to know what immediately incited the occupying soldiers to gun this young girl down in cold blood–other than they’re trained in genocide–because the forensics will be done by the Israeli military. The certainty is that she did absolutely nothing to provoke this monstrous crime. May she Rest In Peace. And may we work tirelessly to build Palestinian solidarity by honoring BDS, with rallies, forums, educational forums. End the occupation of Palestine! Self-determination for Palestinians! If only those who support lesser evil politics in the US had the clarity & insights that this Kashmiri writer has about a born-again bureaucrat trying to neutralize Kashmiri popular resistance to occupation & colonialism. An excellent analysis! It cannot be said strongly or often enough that every time we do not act to oppose the laws–now operating in 26 US states & being made a law by the US Senate) making support for the cultural & economic boycott of Israel a felony, we are not just weakening Palestinian solidarity but undermining the US Bill of Rights which is the foundation of American democracy. We need to form local, state, & national coalitions to systematically oppose & defeat these attacks on free speech, free association, the right to assembly, the ability to build solidarity against war, occupation, genocide. If we do not, we will be forced to abandon the Black community (where systematic & egregious violations of the Bill of Rights have been unchallenged for over 35 years) & Palestinians who these laws have in their crosshairs & all the rest of us will be completely disarmed against the advance of tyranny in this country. 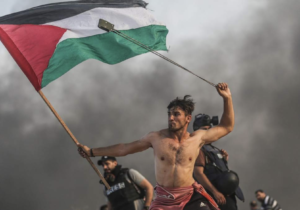 Palestinians are fighting a life & death battle against genocide. Either we move into action to oppose these anti-BDS laws or they again will stand alone. The majority of Democratic senators voted in violation of the Bill of Rights to make supporting the cultural & economic boycott of Israel a felony punishable by substantial fines & jail time. Elizabeth Warren, Bernie Sanders, & Kirsten Gillibrand, who all support Israel & oppose BDS, were among those few who voted against the bill. Minnesota Senator Amy Klobuchar who prosecuted me for protesting against experimentation on live animals & is now running for president in the 2020 elections was among those supporting the bill. Perhaps an Assad supporter can explain to these two little girls why it was necessary to bomb their home to save his regime. Did he mistake them for ‘jihadi terrorists’? Sorry to be the bearer of bad news, but the US has no plans whatsoever of ending its war against Afghanistan. The official Pentagon estimates of US troops deployed there is 14,000 of which Trump intends to draw down only 7,000. The Pentagon does not report the number of mercenaries, special forces, or CIA operatives it deploys there but the numbers are considerable. NATO ended its Afghan combat operations in December 2014 but nine countries (Italy, Germany, the UK, Georgia, Romania, Australia, Poland, Turkey, & the Czech Republic) still have a total of 13,000 troops in the country. 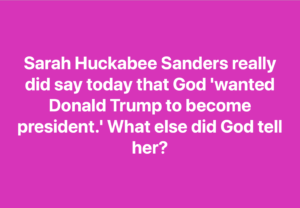 What about them? Obama’s so-called ‘withdrawal’ from Iraq is instructive for what the US means by withdrawal. There was great fanfare in October 2011 about the full withdrawal of US troops but the Pentagon left over 20,000 personnel in the Baghdad embassy which is walled off from the rest of the city. What the hell are they doing there? 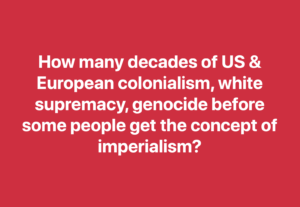 How many are mercenaries, special forces, CIA? One year ago it was reported that there are 5,200 US troops in Iraq (not counting mercenaries, special forces, & CIA). When were they re-deployed to Iraq? But it isn’t just a matter of troop numbers in an age of high-tech slaughter by drones, robots, bombers. Most of the siege of Mosul in 2016 was by US bombers. The number of US troops involved is not reported because they are called trainers for the Iraqi military just as the remaining troops will be in Afghanistan. 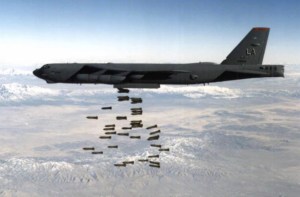 The photo is a US Air force B-52 bomber dropping a load of 750-pound bombs. B-52s & stealth bombers are some of the aircraft used in attacks on Afghanistan. The C-130 Hercules military transport plane was used to drop the Mother of all Bombs on Afghanistan in April 2017. US & all foreign troops out of Afghanistan!